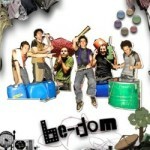 Cheeky, clever, fun, charismatic, interactive… Be-Dom provides an infectious experience of epic proportions. Using nothing more than everything you can think of, the group will drag you into their crazy vaudevillian world. Back to Fringe after four years touring around the globe, Be-Dom now dares you to witness the premiere of their new show. For more information on the show visit their website or to purchase tickets click HERE.